A substantial and adapted five bedroom detached family home, situated in the popular residential area of Maidenbower. Upon entering the property, you are greeted with a storm porch with replacement front door leading to the entrance hall with stairs rising to first floor, under stairs storage cupboard, wood effect vinyl plank flooring and recessed down lighters. A door on your right leads to the cloakroom with low level WC, wash hand basin within vanity unit and tiled splashback, heated chrome towel rail, recessed down lights, wood effect vinyl plank flooring and opaque window to front. To your left is the living room with bay window to front and recess for a flat screen television. To the rear of the property expanding the entire width is the refitted kitchen/dining room. The kitchen/dining room is fitted with a range of wall and base units, sink unit, granite work surfaces, space for a Rangemaster cooker with extractor hood over, integrated fridge/freezer, dishwasher and washing machine, breakfast bar, part tiled walls, recessed down lights, wood effect vinyl plank flooring, space for a six-seater dining table and chairs, window and door to rear garden. 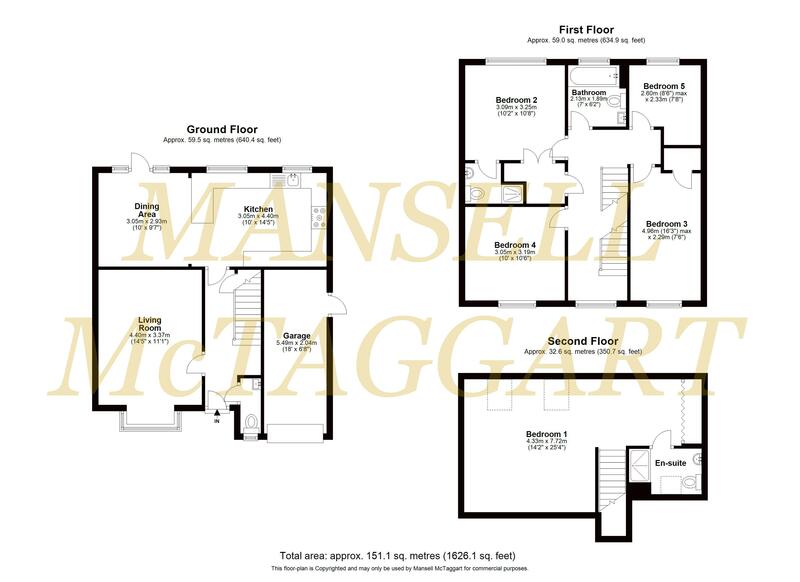 Stairs from the entrance hall lead to the first floor landing giving access to four bedrooms, family bathroom, as well as access to the airing cupboard housing the ‘Megaflo’ hot water cylinder, recessed down lights and window to front. Bedroom two overlooks the rear aspect, built-in double wardrobe, recessed down lights and door to en-suite comprising of a shower cubicle with secondary detachable shower head, wash hand basin within vanity unit low level WC, fully tiled walls, tiled flooring, heated towel rail, recessed down lights, extractor fan and opaque window to side. Bedroom three overlooks the front aspect and has a built-in wardrobe. Bedroom four is located to the front aspect with recessed down lights. Bedroom five/study overlooks the rear, again with recessed down lights. Finally, the first floor is completed by the family bathroom comprising of a white panel enclosed bath with separate shower head, low level WC, wash hand basin within vanity unit, fully tiled walls, heated towel rail, tiled flooring, recessed down lights, extractor fan and opaque window to rear. Stairs from the first floor lead to the second floor landing where you can find the master bedroom with vaulted ceiling, four Velux windows, eaves storage, fitted wardrobes and door to the refitted en-suite comprising of a double shower cubicle with secondary detachable shower head, low level WC, wash hand basin within vanity unit, heated towel rail, fully tiled walls, tiled floor and Velux window. Outside to the front there is a driveway providing off road parking for two vehicles, flanked by lawn area, hedge border, allocated parking bay to the side of the property and access to the garage with up and over door, power, light, replacement wall mounted boiler and door to side. Gated side access leads to the rear garden which is mainly laid to patio and lawn, shrub borders, timber shed, all enclosed by wooden panel fencing. Outside to the front there is a driveway providing off road parking for two vehicles, flanked by lawn area, hedge border, allocated parking bay to the side of the property and access to the garage with up and over door, power, light, replacement wall mounted boiler and door to side. Gated side access leads to the rear garden which is mainly laid to patio and lawn, shrub borders, timber shed, all enclosed by wooden panel fencing. Location The property is located in the popular Maidenbower Village and lies within a short walk of the local shopping parade with its selection of convenience stores, restaurants/takeaways and a public house. There are a number of excellent schools within the village together with a sports centre (HBG Leisure) based at the secondary school, Oriel High. Crawley town centre with its excellent selection of shops, restaurants, recreation facilities and schools. Three Bridges mainline railway station with fast and frequent services to London and the south coast is approximately 1.3 miles distance. Crawley railway station is approximately four miles distance and Gatwick Airport and Junction 10A of the M23 are also within easy reach. Schools The Brook School, Maidenbower Infant and Junior Schools and Oriel High School.